The 2016 winners of the IHC Global sponsored* Reducing Urban Poverty Graduate Student Paper Competition are Valeria Vidal Alvarado, Francis Goyes and Sera Tolgay. The MIT Masters in City Planning students come from three very different backgrounds- 26-year-old Alvarado is from Lima, Peru, 26-year-old Goyes is from Quito, Ecuador, and 25-year-old Tolgay is from Istanbul, Turkey- but they have pooled together their expertise and experiences to create a project focused on something that they care deeply about. As the refugee crisis remains one of the most pressing global issues at hand, much attention is paid to the journey; where the refugees go, how they get there, and if they’ll be allowed in. Much less focus is on what happens to these families after they receive sanctuary. Their research project does just this; Refugees, Incremental Housing and Shelter in the 21st Century seeks to examine the design and implementation of the incrementing housing model of the Norwegian Refugee Council (NRC)’s Urban Shelter Program in cities in Northern Jordan, and provide recommendations on how it can improve. 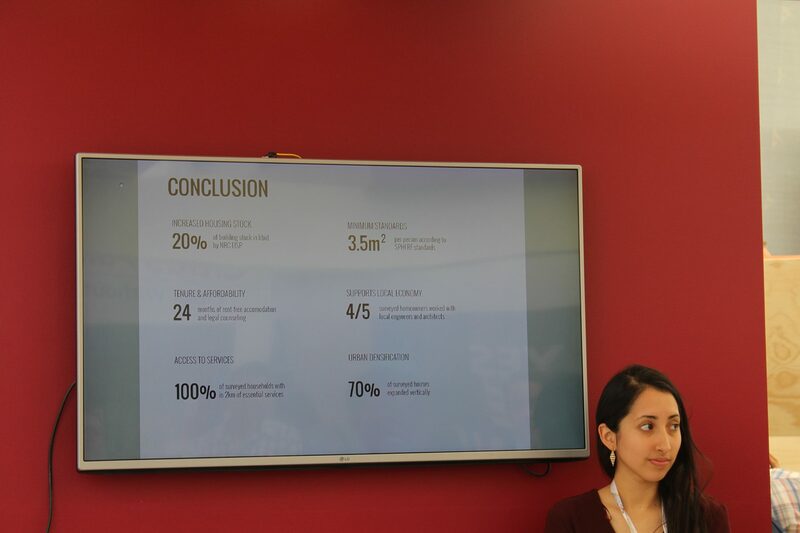 The paper was selected out of hundreds of entries as the winner of the competition, and Alvarado, Goyes and Tolgay were given the opportunity to present their findings in front of a captivated audience at Habitat III in October, in Goyes’ hometown of Quito, Ecuador. IHC Global International Communications Officer Rebekah Revello interviewed the three researchers about their project, what it means to them, and what they hope it will do for refugee communities around the world. Can you give a brief summary of your project? FG: The NRC program intends to provide adequate shelter for vulnerable Syrian refugees by supplying grants to Jordanian homeowners to increase rooms or floors to their existing houses. Syrian families are then allowed to live in these expansions rent-free for up to two years. After the two year period is over, Jordanian homeowners can decide if they want to continue to renting to Syrian families or use the expansions for a different purpose. What initially drew you to your project? Why did you choose the subject? FG: I was interested in this project for a number of reasons. Having lived my entire life in Ecuador, I was accostumed to the incremental housing approach the majority of families practiced – houses are built informally, and expanded through time based on the growth in family members and the financial resources they have access to. I was very curious to understand how NRC could draw inspiration from incremental housing to then use it as a solution for housing refugees. Furthermore, the NRC program was also interesting to me from a city planning perspective. Much attention is drawn to refugee camps like Zaatari and Azraq, yet the majority of Syrian refugees live in urban areas, as there they have greater access to economic opportunities, as well as social infrastructure and networks. However, many cities are unable to accommodate the increased demand for housing, and many refugees are forced into substandard living conditions. Urban programs for housing refugees that provide cash-for-rent assistance intend to solve this condition, yet in turn increase rental prices in cities and saturate the market. NRC’s program increases the housing stock, thus bringing more equilibrium to the housing market. Given the enormity of the Syrian humanitarian crisis, I also wanted to use this opportunity to draw attention to this innovative program in the hope that it can be adapted in other countries that have also opened their doors to refugees. VVA: The possibility to make a small contribution to solving the refugee crisis, understanding why projects work, whether these can be replicated or adapted in many other parts of the region that are currently facing a similar problem was the reason why I became interested in this project. Dr. Reinhard Goethert, Professor at the Department of Architecture at MIT was the one who pointed out the great potential that incremental housing, slowly expanding the houses over time, could have to help the refugee crisis which then led me to further investigate if this was a strategy already being taken advantage of. ST: As part of our research group, Special Interest Group on Urban Settlements at MIT, we had been studying incremental housing models around the world, trying to understand the factors that make housing projects successful. We really took a “shelter plus” approach, where housing is not just a roof over your head but also the accessibility to a bundle of services like transportation, education or markets that make day to day life possible. The NRC project is very interesting because it acknowledges the reality that the majority of refugees in fact live in urban areas (this number is close to 85 % in Jordan). In Turkey, for example, the government has responded to the crisis by setting up state-of-the-art camps, but this has not been a sustainable solution as people have left the camps to go to cities, where they have more access to services and jobs. We thought that the NRC problem recognized this dynamic from the start and could provide a model for providing shelter for urban refugees. Alvarado and Goyes look on as Tolgay presents. What sort of feedback have you received about your project, from colleagues to the international community? FG: We’ve received very positive feedback from our university and other colleagues. I’m particularly happy that other NGO’s and government organizations that didn’t know about the program before have become aware of it through our presentations at Habitat III. VVA: The team has received overwhelmingly positive feedback about our project. Many fellows students, Professors and international organizations have reached out to read our paper, further discuss our analysis as well as request us to make presentations. It has been quite touching to know that we are able to have this experience inspire others to learn and work on the issue. ST: It was also interesting to hear reactions from audiences about how the refugee crisis is typically associated with camps, so our research in urban areas gathered a lot of interest. 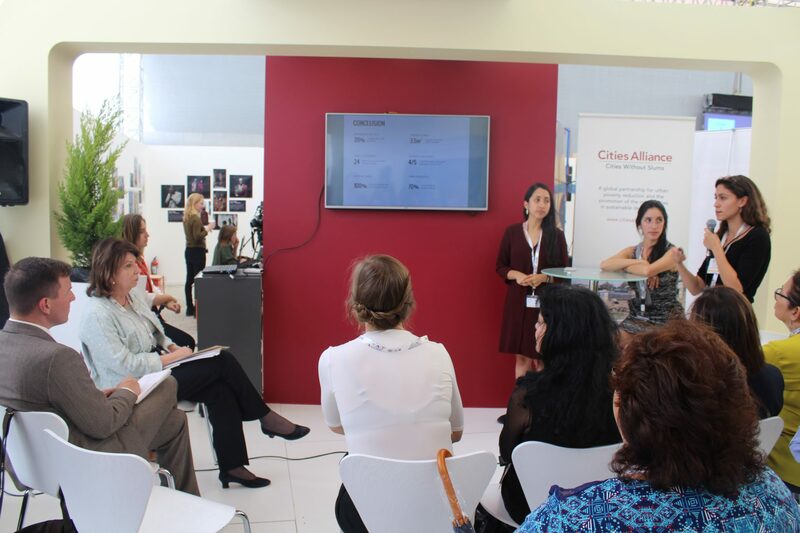 What do you think presenting at Habitat III has done for your research? FG: It’s definitely increased awareness of NRC’s program, especially for people from private and public sectors that work in the humanitarian sector. 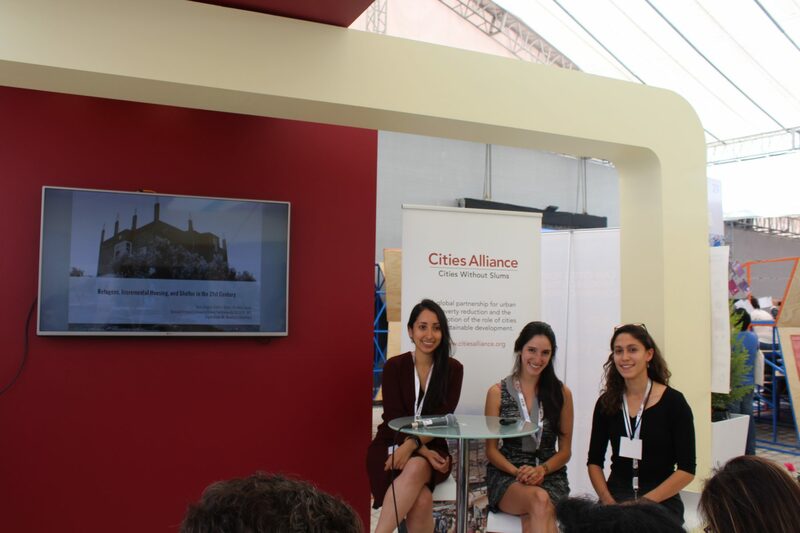 VVA: Presenting at Habitat III has opened a lot of doors for me. From giving me more exposure in the school on the potential and quality of my work as a researcher, to networking with organizations I would love to work at as well as meeting many other people who are as passionate as I am about the issue to further collaborate on research. ST: Through our presentations at Habitat III, we got to exchange ideas with a number of organizations, such as the Project for Public Spaces, Affordable Housing Institute and Habitat for Humanity, who are all working on the issue of housing for refugee populations from a shelter plus approach as well. Given the enormity of the current crisis and the shortcoming of traditional humanitarian approaches, we saw how critical it is to develop flexible models that can bring the host communities and refugee populations together rather than creating silos. What do you plan to do with your research going forward? FG: I’m excited to see it published in the Wilson Center’s annual Urban Paper Competition book. I also hope others continue researching this and other innovative intiatives in Jordan and other countries. VVA: I hope that the research can continue to be disseminated in different ways. The analysis of the research has also prompted Dr. Reinhard Goethert to continue with this line of work looking at another case study in Lebanon that could potentially be used for comparison and the exchange of best practices. ST: One key takeaway from our research in Jordan is the fact that employment opportunities will directly affect the sustainability of any kind of housing model in the coming years. While the Jordanian government has announced that they will be giving work permits to a portion of the refugee population, many are still forced to take low-wage, low-skill jobs to provide for their families. To re-think employment in this context, I will be taking part in a long-term initiative through the Art, Culture and Technology group in our department, called Future Heritage Studio. It is currently at a very nascent stage, so I cannot provide a lot of information yet, but through a collaborative design workshop with the refugee population and local partners in Jordan, we are hoping to identify ways in which art, technology and design can be combined with existing know-how, crafts and skills to provide alternative livelihoods. How do you want your research to be used to help the communities you studied and others like them? FG: I intend this research to serve NRC and other governmental and non-governmental organizations that are interested in creating humanitarian programs that are urban, creative, and site-specific. VVA: In the most practical way, the research can be used to duplicate NRC’s Urban Shelter Program in other areas of Jordan or neighboring countries that have a similar housing ecosystem. At the same time, the analysis of the research has highlighted that it is quite expensive to keep up such a comprehensive program. In this regard, the research can provide insight and pin point certain areas that have the potentially to become more cost saving. ST: Additionally, we hope to draw lessons for other contexts regionally, like in Lebanon, which has an even larger urban refugee population than that of Jordan. At a larger scale, globally, the number of refugees, asylum-seekers and internally displaced people around the world has surpassed 60 million for the first time in history, so as people are forced to flee their homes due to conflicts or natural disasters, these innovative models will be especially critical in the years to come. Alvarado listens to questions from the audience at Habitat III. What do you think the New Urban Agenda will do for urban refugee communities? FG: I hope the NUA increases awareness of urban refugees and internally displaced populations. I particularly wish that the NUA emphasizes the need for a human rights approach to projects intended to help urban refugee communities, and more data about urban refugees is gathered and shared with the humanitarian community. VVA: I believe that the New Urban Agenda helps urban refugee communities by setting the issue at the forefront of the international community. This then is able to spark discussion and more allocation of funding to help with the different issues such as housing that refugees have to deal with. Creating awareness of the urgency to address this use, as well as setting the guidelines and priorities to do so, is definitely the first towards more concrete solutions, such as funding research, to fund programs like NRC’s Urban Shelter Program as well as do evaluations of such, which is as extremely important as just designing and implementing the project. The evaluation phase helps to keep the program aligned with the changing needs of the refugees. ST: Similarly the people-centric approach called for in the NUA can also be applied to the humanitarian field, where the complex and multifaceted problems faced by urban refugees require going beyond providing baseline needs. Given your research and the current trajectories, what do you think will happen with urban refugee communities over the next few years? FG: I think urban refugee communities will continue to grow around the world, especially as more vulnerable populations have to migrate from the negative effects of climate change. I hope that lessons learned from the Syrian refugee crisis and others before it provide the humanitarian community with expertise for these changing times. VVA: This is quite a tough question to answer. As the current situation is going, the number of urban refugee communities will only keep increasing. However, we are seen positive programs like the NRC helping to alleviate the problem, at least one of the problems, safe and reliable shelter. The refugee crisis problem is quite complex and sensitive subject to address, both from a refugee and host country perspective. However, I think that as long as we know that we are doing the best to help families who have been forced to flee from their homes until it is safe to come back, I’m sure we will be able to learn how to best adapt our built environment and our attitude towards the issue. What have you personally learned from this project? FG: This project has given me an incredible opportunity that I am immensely grateful for. Academically, I have grown tremendously through this experience, learning much more than I did before about humanitarian work and the ongoing refugee crisis. 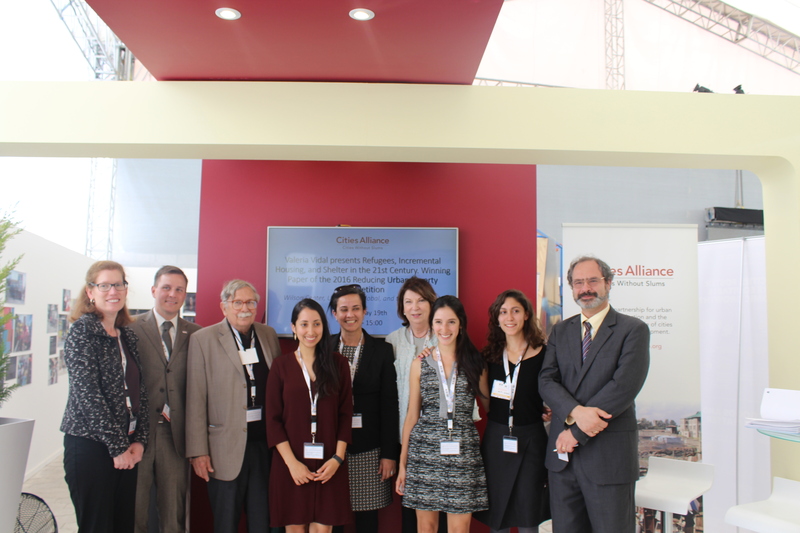 The project has also expanded my professional network, particularly through our presentations at Habitat III. Personally, I have developed new friendships with people that I would have never had the opportunity to meet if I had not participated in this project. VVA: I have learned many things from this project. I have been fascinated by the passion and dedication that people have towards solving this issue. This project has also brought hope that there are good stories to share about programs that are helping refugees and positive experiences between refugees and homeowners who rent their spaces to them. As it was my first time in the Middle East, this research trip served also as a very rich cultural immersion. This project has absolutely helped me grow as a person and a professional; it exceeded my expectations in various ways. I think what made our project special was that we had the unique opportunity to be in the field for about three weeks not only analyzing the project technicalities but also learning about people’s lives, their stories, their struggles and their favorite meals. The personal connections we made throughout our research were the most rewarding and memorable parts of this project. ST: Seconding Francis, this project has shown us the importance of taking the leap to do fieldwork in a new and challenging environment and the power of teamwork to make this happen. It was a great privilege to meet in person the Syrian families and also to hear from the Jordanian homeowners, some of whom came to Jordan from Palestine as refugees themselves. Despite the gravity of the situation in Syria, I hope that sharing these positive stories can inspire us to go beyond the immediately possible.